In the north-western part of the country lies this land of dense vegetation and profound historic wealth. It was here that Portugal’s first king, Dom Afonso Henriques, was born in the beginning of the 12th century, having then extended the kingdom to the south, in what was considered as one of the most heroic feats of the Christian Reconquest. The inheritance of a distant past is seen everywhere. Stay at one of the excellent manor-houses and mansions with coats of arms, and enjoy the aristocratic tradition of hospitality. Along with this unreproachable art one may en joy an abundant gastronomy, light, acidulous wines (vinhos verdes) and rich wines, and a variety of handicrafts that mingles the shine of` the filigree with the colour of the local embroideries. The country’s longest motorway (A1, from Lisbon to Oporto) goes up to Braga (A3), in the heart of Costa Verde. If you follow the coastline on the road from Vila do Conde to Valença, you will not miss the beautiful beaches, seaside resorts and enchanting villages such as Caminha and Vila Nova de Cerveira. Inland and worthwhile visiting is the Peneda-Gerês National Park. Throughout the region the rivers, waterfalls, vineyards and fertile plots combine with the ancestral monuments in urban centres. Oporto, the capital of the country’s northern regions, with its international t airport, offers the delights of a riverside city as it is magnificently situated on the mouth of the Douro river, from where boats leave to sail up the beautiful river. Seaside Viana do Castelo, ecclesiastic Braga, and medieval Guimarães are but a few other examples of a happy alliance between popular heritage and cosmopolitan elegance. Amarante – crossed by the river Tâmega and surrounded by mountains, this pretty town proudly displays its 17th century mansions, with colourful balconies of painted wood brightly decorating the narrow streets, its restaurants with terraces overlooking the river or the beautiful bridge of São Gonçalo which leads to the great monastery of the 16th century that bears the name of the same saint. Barcelos – medieval walled town with a dungeon. Worthy of a visit are the Ceramics Museum, the Archaeologic Museum of the Dukes’ Palace, the mother-church (Roman-Gothic), and the churches of Terço, Cruzes and Benedictine Convent. Walking tours: around the ancient Jewish quarter or in the streets with medieval houses and Baroque manors; boat tours: on the Cávado river. Boticas – where bucolic sceneries seem to depict an austere rural life characterized by ancient customs and traditions kept to this day. Such is the case of the “vinho dos mortos” (“wine of the dead”), a beverage which owes this original name to a piece of history: in 1809, the local inhabitants buried their wine to keep it from falling into the hands of the invading French. When Napoleon´s army was gone, they found the wine had improved; the bottles were termed “dead” and the practice of burying them for about two years still continues. Braga – Founded by the Celts in 300 B.C. and a Roman administrative centre in 27 B.C., Bracara Augusta, as the Romans named it, combines the religious importance with today’s commercial and industrial prosperity. To visit: the Cathedral (12th-18th centuries), the Treasury and Sacred Art Museum; the Museum at the Biscainhos Palace; and the Dom Diogo de Sousa Museum. Also deserving to be visited are the churches of Misericórdia (Renaissance), Pópulo (17th-18th centuries) and of Nossa Senhora Branca (18th century). On the outskirts, 5 km away from the centre, stands the Sanctuary of Bom Jesus do Monte, with its monumental Baroque staircase; the Sanctuary of Nossa Senhora do Sameiro; the ancient Monastery of Tibães, dating back to the Suevian period and rebuilt in the 11th century, and the Church of São Frutuoso de Montélios (7th century Visigothic temple). Bragança – Majestic city, with medieval castle and walls, amongst which is the Domus Municipalis, a unique example of civic Romanesque architecture. Special mention must be made to the Cathedral (16th century), Santa Maria Church, Casa da Misericórdia Chapel, Santa Clara Convent and Church (16th century), São Bento Convent and Church (17th-18th centuries), and the Abade de Baçal Museum. At the Railways Museum, 19th century locomotives and carriages. Cabeceiras de Basto – contains various splendid manor houses, dating from the 17th, 18th and 19th centuries, and what is considered the best of the statues of the region, O Basto. Made of granite and representing the body of a warrior, it is assumed that it was built before the coming of the Romans; after the Napoleonic wars it gained, as a joke, the head of a French soldier. However, the main attraction of Cabeceiras de Basto is the ancient and splendid monastery of Refojos, with a dome that stands 33 metres (110 feet) high and statues of the Apostles and the archangel Michael. Caminha – the ancient fortress town of Caminha overlooks the river Minho and is rich in historical and architectural patrimony. The whole town is appealing, with its manorial houses and Medieval defensive walls that seem to whisper old tales and legends, the Gothic mother church, the attractive main square with popular cafés and exhibiting the 15th century Clock Tower, a Renaissance fountain and the 15th century mansion of Solar dos Pitas, with seven fine Manueline windows on the upper storey. Chaves – The 14th-century keep of Chaves castle overlooks the town’s medieval square – Praça de Camões. Within the castle keep is a small military museum where suits of armour, uniforms and other regalia are on display. On the south side stands the parish church with its fine Romanesque portal. The Baroque Misericordia church opposite has an exquisite interior lined with 18th-century azulejo glazed tiles. A few minutes on foot from the city centre is one of the hottest springs in Europe. Water here bubbles up at a temperature of 73ºC (163º F). The spa’s facilities attract both tourists and people seeking the treatment of rheumatism, kidney disfuntion and hypertension. 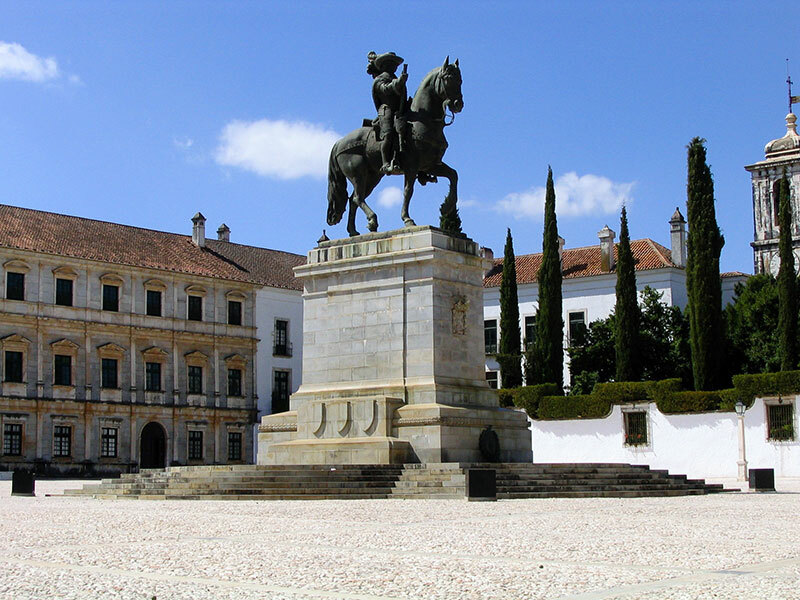 Freixo de Espada a Cinta – it is imperative to visit the Manueline Mother Church with its exquisite 16th-century portal which leads the visitor into a rich interior, ressembling a small version of the Jerónimos Monastery, at Lisbon. The panels of the altarpiece are attributed to the brilliant Grão Vasco (1475-1540) and include a beautiful “Annunciation”. The pillory, also Manueline, is one of the best preserved and most interesting of the country, and the Miserichord Church is also worth admiring, with its Gothic niche over the main doorway. Guimarães – Portugal’s birthplace, with medieval castle and walls, houses a magnificently well preserved historic centre. In the cloisters of the Church of Nossa Senhora da Oliveira is the Alberto Sampaio Museum; in the cloister of São Domingos Convent is the Martins Sarmento Museum; and in the ancient Dominican Convent is the Sacred Art Museum. Also deserving special mention are the medieval palace of the Dukes of Bragança (15th century), the Church of São Miguel (Romanesque), the Church of Santos Passos (Baroque), and the Monastery of Santa Marinha da Costa (a pousada). Nearby lies the early settlement of Briteiros. Lamego – From the heart of a verdant park rises the Sanctuary of Nossa Senhora dos Remédios, with its magnificent Baroque staircase (686 steps). Medieval monuments: castle, tower-fortress (12th-13th centuries) and Almacave Church. Also worthwhile visiting are the Renaissance churches of Chagas and Santa Cruz, and the Regional Museum. In Balsemão, the chapel of Suevian-Byzantine origin (7th century). Melgaço – the small and tranquil town of Melgaço grew around a fortress built by order of Afonso Henriques, the first king of Portugal (1139-85). The castle, now a national monument, has an impressive keep and dominates the labyrinth of ancient streets and alleys that cross each other within the walls. 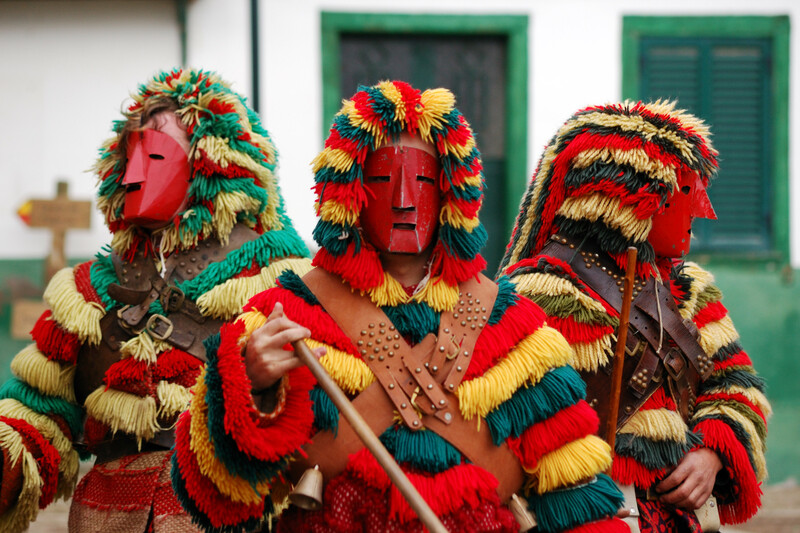 Mesão Frio – although small, the town of Mesão Frio is worth visiting to admire the ancient pillory, the fine mother church of São Nicolau (rebuilt in 1877, it kept the magnificent 16th-century ceiling panels, each one featuring the portrait of a saint) or the cloisters of the former 18th-century Franciscan monastery (Convento de São Francisco) which now shelters the tourist office and the Town Hall. Vila Viçosa has always been rightly considered a jewel in the treasure chest of Alentejo, so it is hardly surprising to find that it has often been included in royal dowries and endowments. Dona Brites, the wife of King Afonso IV, was the first to receive it as a wedding present, followed by Leonor Teles, King Fernando’s lover who was hated by the people of Lisbon, and was later presented to Nuno Álvares Pereira, the heroic general of King João I. There is much natural and man made beauty in town, which covers an area of less than 200 square km. It is easy to reach the conclusion that the natural beauty inspired men to continue to be creative, as the town’s rich cultural heritage would not have been enlarged and improved as it has been over the centuries. In today’s industrial age, nature is still the driving force behind the production of the beautiful pieces of ornamental stone, besides the marble which has long been the mainstay of the local economy. Vila Viçosa will satisfy the demands of the most refined visitor. Historical episodes abound in the churches, convents and palaces, while wild boar and deer run free in the royal hunting grounds “Tapada Real”. As you can no doubt guess, the traditional cuisine of the Alentejo reaches its high point here, with special emphasis on cakes and desserts, above all “Tibornas”. Viçosa also used to be famous for its traditional dishes, like gaspacho frio, açorda com ovos, sopa da panela, sopa de cachola, sopa de batata, sopa de tomate, sopa de beldroegas, sopa de cebola, sopa dourada, migas com carne de porco, pezinhos de coentrada, ensopado de borrego, cozido a alentejana, bacalhau or sardinhas assadas or the various types of sausage used to cook favada. The town also produces traditional fresh, half cured and cured cheeses, and is famous for its olives. traditional Portuguese farm houses, with swimming pool, dating back to the 16th century. Built around a Roman hermitage amidst a mature orchard of olive, cork and stone oak, almond and orange trees. The complex of spacious comfortable well furnished farm houses consists of a main house, Casa Rosamarinho (7 pers) with 3 bedrooms and 2 seperate farm cottages, Casa Tomilho (5 pers) with 2 bedrooms and Casa Lavender (2 pers) with 1 bedroom. All houses have their own kitchen, sitting room, ample covered terraces with lovely views. Good heating and cooling (fan) system and TV available. The Quinta do Colmeal has been the residence of bon João Athayde, Count of Alva and general of King Pedro II, between 1724 and 1751. The general used the walled Quinta as a supply of oranges, watermelons, green beans and olives for his army. Enjoy the peacefulness, a flock of sheep grazing on the herbal pasture, under the trees… Enjoy the 11×11 m swimming pool situated in the orange orchard, bordered by a sunbathing lawn and at the edge of a roman bridge. The Quinta do Colmeal is situated in a historical setting within 3 km of Vila Viçosa, famous for the hunting palace of the Portuguese kings. Within the region of the fortified towns of Elvas, Borba, Estremoz and Alandroal. Within half an hour drive from the world heritage city of Evora. Golf courses in Portalegre and Badajoz. Hiking, biking, fishing and bird watching. Not to forget the restaurants with there specialities of the Alentejo and the excellent Borba wines. An abundance of artisans show their leather goods in Terugem, pottery work int Redondo, stone carvings in Borba and carpets in Arraiolos.